They’d been acquaintances for a long time, having lived in the same neighborhood then moved away from one another for years. But in May of 2016, the two reconnected and began dating. The Great Flood of 2016 sealed the deal for Jake Donaldson and Jennifer Bailey, the two working alongside one another as members of the impromptu Cajun Navy to rescue people stranded by the high water. Neither said anything to the other, but Jake’s realization that Jennifer was the woman he wanted to spend the rest of his life with came on the same day. “He was my best friend, I knew without a doubt I loved him,” she said. The two had met 14 years prior when Jennifer and her family moved into Jake’s neighborhood. “We all became good friends and I was often fishing or hunting with her sons,” he said, but two years later, Jennifer and her boys moved away. Jake messaged her and asked her if she’d like to join him for a fishing outing at his mother and stepfather’s camp. “It was just what I needed,” Jennifer said. “That weekend was filled with laughter, good food, competitive fishing between old friends and anchored out in the lake with talks about old times and where life had taken us and watching sunsets,” Jennifer said. The romance reached a tipping point during hunting season, when Jake “bit the bullet,” in his words, and bought an engagement ring. Next item of business was to choose a date, which turned out to be easier than either of them thought. “I believe my dad placed Jennifer back in my life for a reason – to remind me that Denham Springs is my hometown and that genuine love and appreciation still exist,” he continued. “I have been blessed beyond belief,” she said. 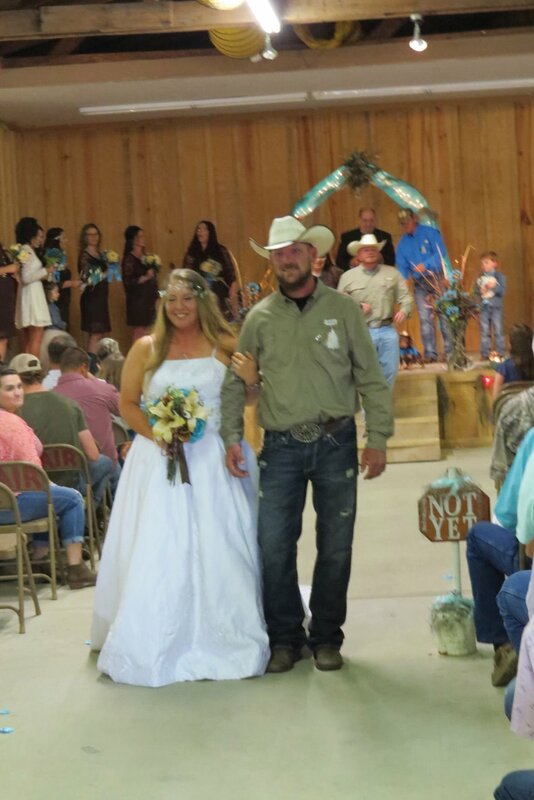 The two were married in the barn on the grounds of the Livingston Parish Fairgrounds, surrounded by friends and family. The bridesmaids and bridesgrooms were all people the couple had connected with during the flood. Tommy Comeaux is the Lifestyle editor at The Livingston Parish News. He can be reached via email at TommyComeaux@gmail.com. You can also follow him on Twitter @tommycomeaux.